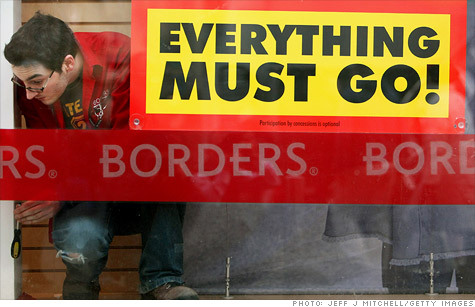 Borders, the bankrupt bookstore chain, announced plans to liquidate Monday. NEW YORK (CNNMoney) -- Borders Group will liquidate its remaining assets after efforts to find a buyer fell through, the bookstore chain announced Monday. The nation's second largest book seller, which filed for bankruptcy protection earlier this year, currently operates 399 stores and employs approximately 10,700 workers. The liquidation process is expected to start as soon as Friday, pending bankruptcy court approval, Borders said in a press release. Mike Edwards, president of Borders Group, said in a written statement that he was saddened by the development and that the decision came despite "the best efforts" of all parties. "We were all working hard towards a different outcome, but the headwinds we have been facing for quite some time, including the rapidly changing book industry, eReader revolution, and turbulent economy, have brought us to where we are now," Edwards said. The announcement comes days after a deal with Direct Brands fell through. Direct Brands, owned by private investment firm Najafi Companies, had proposed a plan to buy Borders' (BGPIQ) assets for $215.1 million and assume $220 million in liabilities. But the group said Wednesday that the deal to keep Borders operating was "no longer supported by the deciding parties." "The deciding parties' legal team and financial advisors have elected another option which is in contrast to what we had envisioned for the future of Borders," the company said. Borders, the No. 2 bookstore chain after Barnes & Noble (BKS, Fortune 500), filed for bankruptcy protection in February when the company also announced that it would close 200 of its 659 stores. -- CNNMoney senior writer Parija Kavilanz contributed to this report. Borders is planning a fire sale!